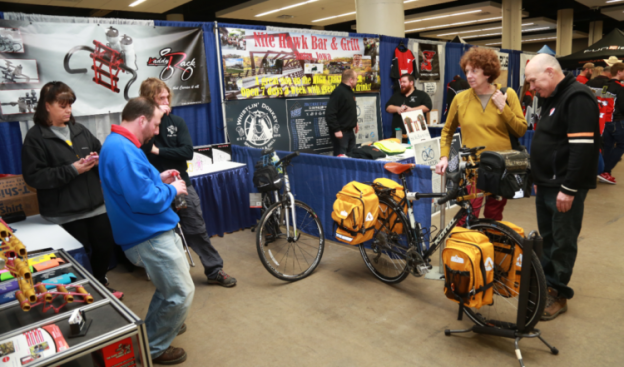 Billed as the largest one-day bike shows in the Midwest, the Iowa Bike Expo offers free admission for those shopping for destinations, gear, bikes, and more. Mark your calendars for January 26, 2019 (10:00 AM to 4:30 PM) in Des Moines at the Iowa Events Center, Hy Vee Hall, 833 5th Avenue Des Moines, IA 50309. If you are looking for bicycle equipment, destinations, events, and more this is the event you want to attend. You will find many Iowa trail systems, events, and equipment vendors exhibiting from all over the country there to show you the latest. There will also be educational seminars helping you get in touch with bike advocacy, find the latest consumer trends, and learn about new places to ride. The list is growing, so check here for updates to the list. 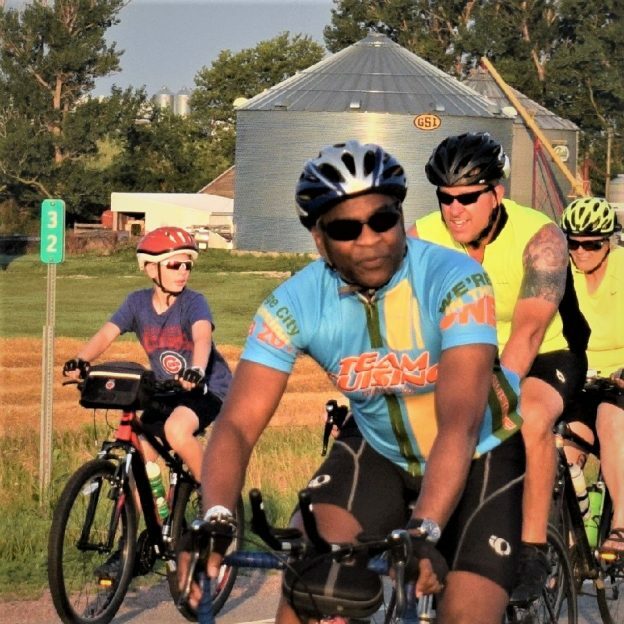 This entry was posted in News and tagged Bike Iowa, discover Iowa, Free Bike Map, Havefunbiking guide, Iowa Bike events, Iowa Bike Maps, Iowa bike trail maps, Iowa Bike Trails, Iowa Bike/Hike Guide, Iowa Mountain biking areas, Places in Iowa to visit with your bike, Road bike Iowa on January 10, 2019 by Russ Lowthian. It’s Friday and time think about getting together and planning some rides with warmer weather soon ahead. Here in this photo we caught these biker dudes having fun riding across Iowa on RAGBRAI 2017. Maybe its time to start planning your #NextBikeAdventure? This entry was posted in Picture of the Day and tagged Bike Iowa, Biker dudes, discover Iowa, Friday fun, Havefunbiking guide, Iowa Bike events, Iowa Bike Maps, Iowa Bike Trails, Iowa Bike/Hike Guide, Places in Iowa to visit with your bike, RAGBRAI, Road bike Iowa on March 23, 2018 by Russ Lowthian. 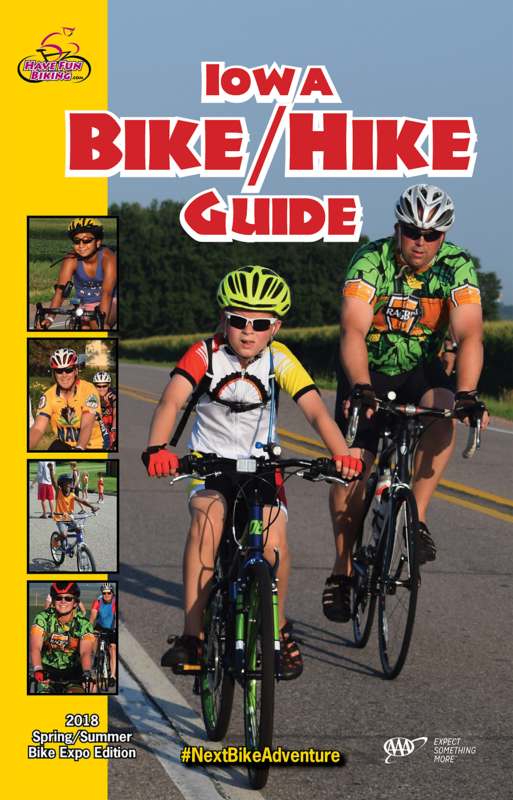 From all of us at HaveFunBikingcom (HFB), we are elated to introduce you to our inaugural issue of the Iowa Bike/Hike Guide. This publication will be available for preview at the Iowa Bike Expo, in Des Moines, before the RAGBRAI Announcement party on January 26th. We started with the HFB website in 2006, publishing the first Minnesota edition in 2009 and now the Iowa Guide. The inaugural Iowa Bike Guide cover you can pick up at the Bike Expo, in Des Moines this Saturday. Like the Minnesota Bike/Hike Guide and our website our goal is to help cyclists easily access the latest information on bicycling,. With listings of fun events, maps on the best places to ride a bike, plus helpful tips on gear and maintenance for that next bike adventure. Our vision still holds true today, as those who attend the Iowa Bike Expo and pick up a free copy will see. If you plan to attend the Expo stop by the AAA – Auto Club Group booth #207, for a copy. If you are not able to attend this coming weekends festivities in Des Moines, watch for the full edition in March. 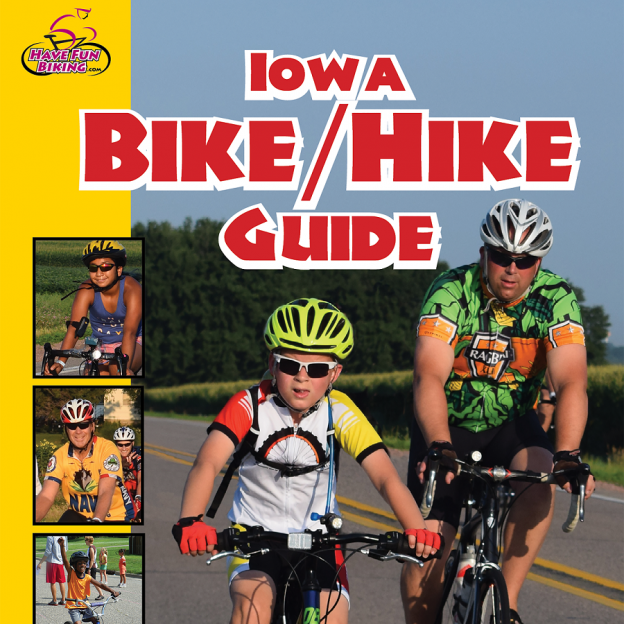 Once we gather and confirm all the bike events happening through the summer, we will will go to print with the full version and the Iowa bike guide will also be available digitally. If you have information that should be in this new guide or our Minnesota publication, its not to late! We need all information, no later than February 15th. Did you see our new Have Fun Biking National Guide? Rolled out digitally last month, many of the articles and tips you see in this guide are also on our blog at HFB. So if you are looking for more updated details, along with additional descriptive photos and links, we have you covered wherever you decide to ride your bike. Also, if you want a sneak peek at what might be in one of our next issues or further details when on the go, please sign up for our weekly eNewsletter on the latest. I promise, your email address will not be sold or shared with any third party. Would you like to view our daily photo ‘Pic of the Day, please like our Facebook or Instagram page. Whether you are new to bicycling or a seasoned cyclist, we hope you enjoy and bookmark our handy publications to your favorite electronic device. Our goal is to continue publishing biking information to help you stay active and healthy. to be successful, so please feel free to share your opinions, ideas, photos and stories on bicycle related topics with us. Just send an email to: poke@havefunbiking.com and we will get back to you. Read on and have fun! This entry was posted in News and tagged Bike Iowa, discover Iowa, Free Bike Map, Havefunbiking guide, Iowa Bike events, Iowa Bike Maps, Iowa bike trail maps, Iowa Bike Trails, Iowa Bike/Hike Guide, Iowa Mountain biking areas, Places in Iowa to visit with your bike, Road bike Iowa on January 22, 2018 by Russ Lowthian.